Welcome to the Simeone Family Web Site From Ann, Rick and Anson SimeonePlease give page and music time to fully load! Enjoy! THIS SITE CONTAINS OUR PHOTOGRAPHS FROM TRIPS TO ITALY AND ASIA, TRAVEL INFORMATION AND OUR PERSONAL GENEALOGY INFORMATION IS HERE ALONG WITH LOTS OF INTERESTING INFORMATION. WE WELCOME OTHERS IN OUR FAMILY TO ADD TO OUR PAGES. ENJOY AND COMEBACK AND VISIT OFTEN! CLICK THE RAINBOW FOR OUR ORLANDO, FLORIDA WEATHER! Ann & Rick Simeone in their restaurant, Tino's Ristorante when first opened. Those pizzas are some of their handywork. Yum! "Best on the Barriers" was the motto and that's no lie! 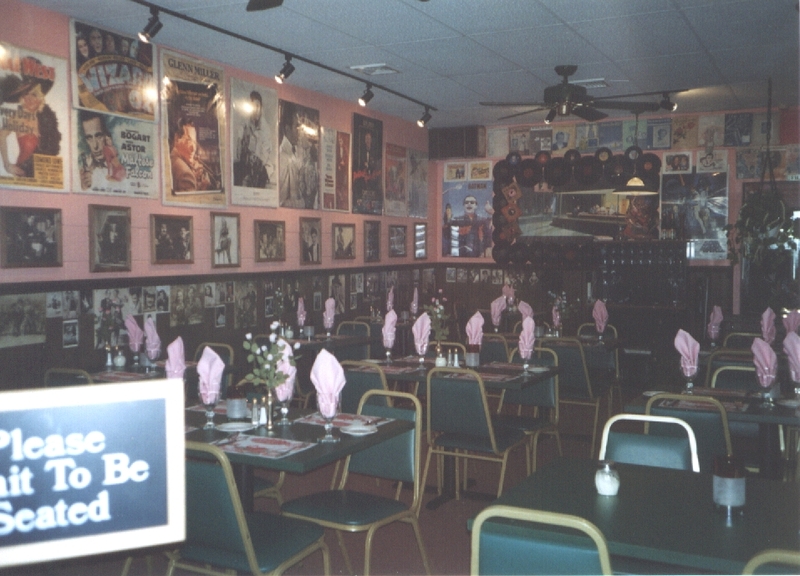 Tino's Dining Room during the first years. We had 10 booths and the patio outside and did mainly pizza and subs. 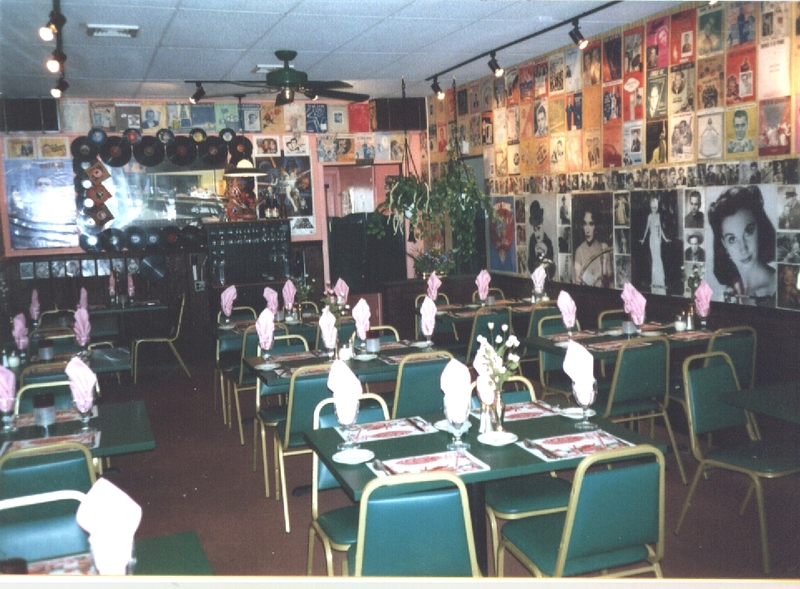 Tino's Dining Room after converting to a Family Style Restaurant with full service. We served complete dinners, allowed people to bring in their own wine and beer and of course had the pizza. Fine china, crystal and cloth table napkins under indirect lighting made for intimate dining! The other side of the room. Note all the photographs, records, sheet music and posters covering the walls. Many of these were autographed. 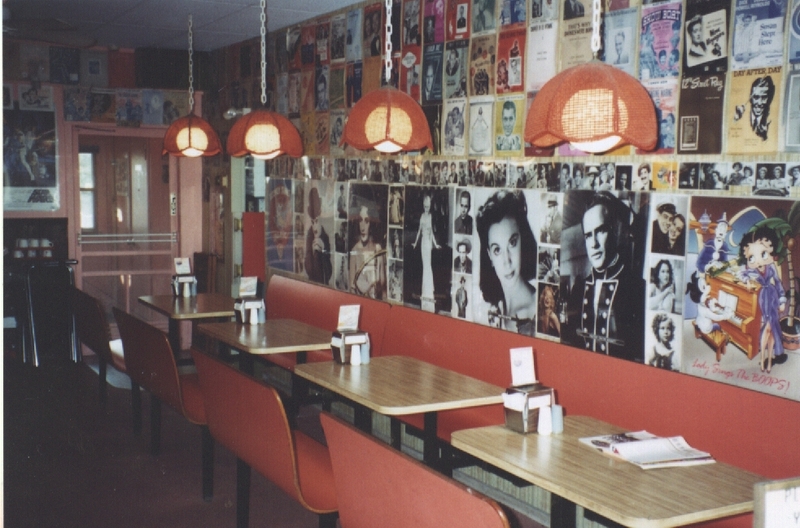 We collected these for movie stars and musical performers from 1900 to 1998 on these walls. Some of those records are originals from Edison's first recordings. There was plenty to see and enjoy while enjoying our great home made food. This is where the family started it's first restaurant. Located on what was then Hudson Boulevard in North Bergen, New Jersey, this was taken in 1934. That's my Dad, Grandmother, Rosa Simeone and my Uncle Paul. What is interesting is that in 1961 I was working in this same shop, learning the butcher trade from Sam the Butcher and didn't know at the time of my family's once owning the building! All the imported Italian tiles were still there as was the old wine cellar in the back floor! My name is Rick Simeone. I was born and raised in an Italian community in North Bergen, New Jersey and spent about 20 years in the Chicago, Illinois area. My wife Ann is from the Chicago area. It was while I was in the insurance business there that my wife and I met. She owned and operated a nursery school and was a member of the local Chamber of Commerce that I helped chair. We married, and after selling our property and other interests, moved back to New Jersey and opened Tino's Ristorante in Ortley Beach, New Jersey. Over the years we changed from a small pizzeria to full service intimate dining and Tino's was once rated three stars by a local newspaper! I have owned part of an insurance brokerage, owned a graphic arts studio and an advertising agency and have operated a restaurant consulting firm. When my wife said she wanted to do something we could do together, a restaurant was to me, a natural move, as I love to cook. Pity my accountant who recommended I open a restaurant after tasting my Italian cooking! The new business was in another state! After 16 years of hard work in the restaurant business, we have sold the restaurant and relocated to Winter Park, Florida. UPDATE: After a very interesting time of semi-retirement, I took a job as a sales consultant with a furniture store in Altamonte Springs, Florida. Though I met some most interesting people including some famous ones, and worked with some of the most wonderful people I have known, it just was not me. I'm a person who enjoys being my own boss. SUCCESS>>>>>>> I now have a thriving hot dog business in suburban Orlando. Working from a hot dog cart I sell the famous SABRETT HOT DOGS everyone in New Jersey and New York loves and of course those Sabrett Onions in the Red Sauce! Along with my retirement in mid 2006, this is just the thing to keep the entrepreneur in me happy and the plate on our table full! My new business, HOTDOGS al la CART is a five day a week enterprise that will carry Ann and I through to those "Golden Years" I keep hearing about, whatever they are! I am presently interested in my Italian heritage (genealogy) and my Italian family background in the Italy. A town called Conca della Campania, between Monte Casino and Caserta, Italy, is where my Grandfather was born, and possibly my Grandmother. This has kept me busy. A photographer hired by me, took photos of the area, and later my cousin Ralph Simeone visited there too. We have found traces of our past. I hope to get there soon and was only sorry that we did not have all this information when I visited the boot. We have found the home our ancestors were born in and my cousin and I now cherish the piece of the tile roof we each have. If you have any information on this village, let me know. I used to fish a lot in fresh water, mainly for bass, and when we lived on Barnagat Beach Island, New Jersey where my restaurant was. I fished salt water only occasionally. I usually kept an eye on the beach with my 4 wheel drive Jimmy, fishing only when the fish were there and actually biting. It is too much like work otherwise. I let the tourists find the fish when possible, then I drove to the beach and caught them! We now have a home in Winter Park, Florida with a private lake. The restaurant is gone and I can now enjoy my boat, the "JerseyGirl" and the monster bass all year long. I am working on starting a new career. Retirement, it's for old people (whatever that is) not for me. I want to keep active. To me "old" is always 15 years older than me. I enjoy graphic arts programs on my computer, a Macintosh G3 Tower Power PC. My wife is studying Spanish on my other computer, a Macintosh 7100 PPC. We both enjoy photography, video recording and cooking. We love to travel together and do so whenever we can. Take a look at the photographs on this page and you will see traveling can be an obsession. Improving the lawn and my small water garden and mini pond keeps me busy for now, along with updating our 50's ranch home. My wife and I really did travel in the past and we have been throughout the South China Sea area and the countries of southeast Asia. Our travels have included the most interesting places, such as Canton, China (Red China) and Vietnam. (We were among the first Americans to visit Vietnam after the U.S. began relations again.) We have also visited the Dominican Republic, Mexico, Canada, Italy, the Virgin Islands, Hawaii, Japan, Thailand, Malaysia, Borneo, Brunei, Indonesia, Hong Kong, and Burma. (My wife, independently could add about 8 more countries to this list.) We have sat at Hemmingways Long Bar at Raffles Hotel in Singapore, spent both a Christmas and a New Years at sea. (Christmas in Thailand was a real treat!) We have visited the Hill Tribes of Thailand and the Head Hunters of Borneo. We wandered ancient Buddhist Temples in jungle forests and have seen the Barong Dancers of Bali. We gazed on the glory that was Rome, the ruins of the Forum and have seen the destruction that was Pompeii and the smoking volcanos of Naples, Italy. We have photographed the volcanos of the Ring of Fire in the South China Sea as we cruised among the many islands. We have conversed in Chinese, Japanese, Italian, Malaysian and even some Vietnamese. We have spent 23 hours on one airplane and 5 hours in traffic jams on ancient buses in Jakarta and Saigon. We have been to the Canals of Venice and the Floating Markets on the Canals of Bangkok. We visited floating homes in Vietnam and floating restaurants in Hong Kong. We have visited the palaces of the King of Thailand, the Sultan of Brunei, the Emperor of Japan and the former Presidential Palace in Saigon. We have even gazed upon the faces of the Boogie men of Indonesia. Add to this the thrill of walking ancient ruins in Mexico and even Red China. If you travel and have been to any these places, I know how you must enjoy talking about them as I do. I have included some photographs of our trips below. If you plan to visit one of the places we have been to, let me know and I will give you some advise on what to do and see. Also, at the end of this home page, visit some of these places we have been to, by clicking on the places of interest. Ciao for now! My son Anson and I with some "Small" bass from our lake here in Florida! Before leaving New Jersey I came to Central Florida and made a new friend in Winter Park, Florida. John Swann runs a fishing guide service and wow, he led us to the big ones! John is a B.A.S.S. Pro and uses Ranger Boats. If you like B-I-G bass, give him a call at 1-877 SWANNYS (Free call), or drop him a line by E-Mail at "fishing@swannysbassguides.com" John Swann is one of the few guides with a guarantee, no fish, no fee! You will love his webpage too, Just click below and your hooked! We enjoyed fishing with John so much and the lake he took us too, we bought a house there. John and I are now neighbors! Thanks John, for steering us in the right direction. See you on the lake with the Jersey Girl. We were interested in the starting a new business in the area of our home in Winter Park, Florida. We had to sell our restaurant first. Our plan was to start a gift shop or flower & plant center here. I know that my wife and I are good at what we do together, in business, or whatever, and our past success speaks for itself. So, what the heck, give it a try right? It's kind of on hold for a while, but you never can keep a Simeone down. Our motto is part of our family crest, Sempre Avanti, or "always ahead or forward." Ann and I really enjoy good food, expecially Asian. I cook Italian, Thai, Chinese and Japanese dishes. I have taught my wife some Italian cooking. Ann and I enjoy new restaurants and love shopping and exploring new restaurants and foods together during our travels. We are always looking for new foods and recipe ideas and this takes us into some interesting places and situations. It is quite an experience to shop in a strange country, where nothing is priced and you have to bargain for everything, especially in a language you are not good in and money you don't quite understand. Especially interesting are the strange new vegetables and fruits. This always made our travels interesting. You have to be brave to eat what you cannot pronounce or order something when you don't know what it is. (Kind of like what you get in the grocery table ready foods here when you read the box!) Who knows what we may have eaten at some times. This makes for some interesting stories, to many to cover here. VISIT TOKYO. USE THIS HOTEL AND TRAVEL GUIDE. OUR NEXT DESTINATION? WE'RE WORKING ON IT! Our favorite ship, the Ocean Pearl in Hong Kong. Sorry, your browser doesn't support Java. The Church of San Simeone Piccolo on Simeone Street, the Grand Canal in Venice, Italy. The Simeone family gets a real kick out of this, a street and a church with our name, oh, and a saint too! A 3 man deep dive sub surfaces in the Cayman Islands to take us down to part of the Grand Cayman Trench. Tube coral at about 700 feet. Staghorn coral at 800 feet. TIME TO QUIT! GOTTA WRITE MORE OF THIS STUFF!